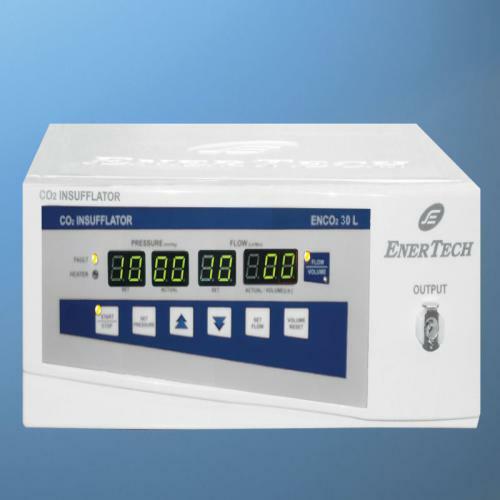 High Performance Cost Effective Technology : Microcontroller based , Feather Touch, Digital System The Enertech CO2 Insufflators are next generation newly designed line CO2 Insufflators with outstanding technical features. These units are controlled by microprocessor of the latest generation. Stable pressure balance in the abdomen is guaranteed by high flow performance with progressive and low insufflation pressure. Features Advance FLow Control : The Enertech CO2 Insufflators stands for AFC ( Advance Flow Control Insufflations ) for precise and safe gas flow control. Software : It's "intelligent" software controlled pressure release mechanism prevents dangerous pressure build up in the abdomen when using such apparatus as laser or argon beamers. Safety : Automatic self check, activated each time unit is switched on, make sure all electronic and pneumatic components are in good running order. Inbuilt System Gas Heater : The unit comes with built in high efficiency gas heater. The gas heater is pre adjusted and works on plug and play basis fully automatically. Real Time Data Display : LED 7 segment display for set pressure, actual pressure set volume, Gas Consumption volume, start stop LED and fault.